Peter Collier, David Horowitz, "Anti Chomsky Reader"
This description is based on the MIT professor's writings on linguistics in the 1950s; but beginning with his criticism of the Vietnam War in the 1960s, Chomsky became much better known for his radical politics than for his theories of language. Over the past forty years he has gained a devoted following in the United States and Europe for his increasingly bitter–some say hysterical–censure of U.S. "crimes." Chomsky has complained about being ignored by mainstream publications such as the "New York Times," but in fact his steady stream of polemical works, like the best-selling "9-11," have made him the center of a veritable cult. 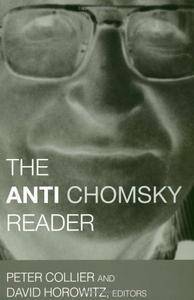 In "The Anti-Chomsky Reader," editors Peter Collier and David Horowitz have assembled a set of essays that analyze Chomsky's intellectual career and the evolution of his anti-Americanism. The essays in this provocative book focus on subjects such as Chomsky's bizarre involvement with Holocaust revisionism, his apologies for Khmer Rouge tyrant Pol Pot, and his claim that America's policies in Latin America in the 1980s were comparable to Nazism. Scholar Paul Bogdanor writes about Chomsky's hatred of Israel. Ronald Radosh and David Horowitz discuss his gloating reaction to the September 11 attack. Linguists Paul Postal and Robert Levine reevaluate Chomsky's linguistics and find the same qualities there that others see in his politics: "a deep contempt for the truth, descents into incoherence, and verbal abuse of those who disagree with him." "The Anti-Chomsky Reader" presents a fascinating composite portrait of a man who arguably is our most influential public intellectual.